Soaring to new animation heights while still staying true to its cartoon roots, The Pig Farmer by award-winning Canadian animator Nick Cross is a quirky and dark comedy that delivers both humor and technical brilliance. The film tells the story of the pig farmer, a wayward soul, who by an unexpected encounter was drawn into an ocean of tragedy and regret. A cautionary tale for drug abuse, this five-minuter short transports us from an old-school barnyard cartoon to a parallel universe of nightmares, drug-induced horrors, and many more. The technique of starting it light before taking the narrative to a darker place was also a good jump-off point for the short. Made within ten months and visually creating the film through storyboards, Nick Cross has wowed the audience with an outburst of surreal imaginings and preconception playing. The pacing of the film was also perfect, each character was given enough space to introduce and settle in the story. 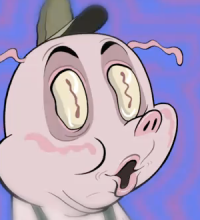 Quietly based from Porky Pig, the character of the Pig Farmer is a grimmer and darker version of the said cartoon as he finds happiness in mental decay and illusions. No matter how you look at it, The Pig Farmer brims with imagination, surreal landscapes, and a hard-hitting lesson. So download, press play, and let this visual gem blow your mind!